Tracks: Bliss; The Lonely One; All Or Nothing At All; Prisoner Of Love; I Guess I’ll Hand My Tears Out To Dry; Moon Ray; May I Come In; I Can’t Help It; Day Dream; After You; Social Call. Personnel: Marianne Solivan: vocals; Peter Bernstein: guitar (1,6,7); Xavier Davis: piano (2,4,8,11); Michael Kanan: piano (5,10); Christian McBride: bass (1,3,6,9); Ben Wolfe: bass (2,4,8,11); Johnathan Blake: drums (2,4,8,11); Jeremy Pelt: trumpet (6). 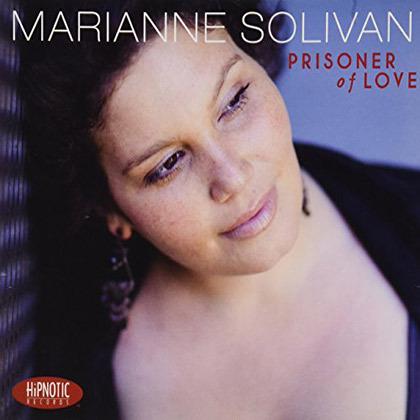 Having reviewed some of the very best the Big Apple has to offer in terms of vocal talent, Marianne Solivan’s Prisoner of Love arrived on my desk with artists such as Jeremy Pelt and Grammy winner Christian McBride singing her praises ( pardon the pun ). It’s good to have friends. As a jazz critic the word friend is somewhat of an abstract concept to me but Solivan enlists the aid of friends such as Christian McBride, Peter Bernstein, Ben Wolfe, Johnathan Blake, Michael Kanan and Xaxier Davis to immediately place Prisoner of Love into the memorable pile of new releases for 2012. Most jazz artists reflect back on a musical epiphany where their artistic life was transformed and jazz became a chosen path. Solivan sums up her epiphany this way…”I just dug it.” Lucky for us. Having reviewed and become fast friends with some of the finest the Big Apple has to offer, Prisoner of Love met with some understandable skepticism which melted away about 30 seconds into the first track. A more traditional vocal performance showcased in a smaller ensemble setting, similar to what you would find in one of New York’s finest clubs such as Small’s has Solivan making an impressive debut. The duet of “All Or Nothing At All” with bassist Christian McBride is as subtle and organic as vocals can be. McBride’s walking bass line and lyrically driven soul are the perfect match for Solivan’s earthy presentation. Most vocalists that attempt a release of this nature get hung up in the vocal trap of self indulgence and never seem to find their way out. Solivan has a clear and obvious grasp of who she is as an artist and the direction she hopes to head. “Prisoner Of Love” is a tune where Solivan contributed the verse and fits perfectly among the other standards and is perhaps a standard in waiting. Solivan is joined by the incomparable Xavier Davis on piano, Ben Wolfe on bass and Johnathan Blake on drums for a sublime performance. “I Guess I’ll Hang My Tears Out To Dry” is one of the finest standards to either move a vocalist to the next level or seal their fate as a singer doomed to be spending Friday nights singing at the local Marriot. Don’t look for Solivan at the local Marriott unless she happens to be on tour. A stunning duet with pianist Michael Kanan shows great depth and sensitivity and the chameleon like ability to transform herself from vocalist to storyteller. Solivan does more than just get by with a little help from her friends. Solivan can stand alongside some of the finest talent in country as an artist whose musical stock is an arrow pointing straight up. Marianne Solivan unleashes a powerful debut recording that should quickly propel her prolific talents to the top of the jazz vocal food chain. Special acknowledgement to Jeremy Pelt who both played and produced this stellar debut recording. Karaoke night, church choirs and cruise ships were meant for singers. The concert stage and recording studio are meant for Marianne Solivan.